The challenge is to use pinks or reds and here is my entry using pinks. 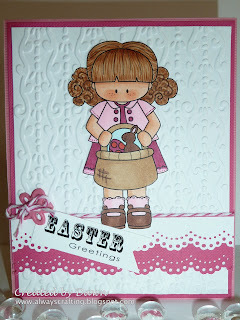 I used the Whimsie Doodles stamp, "Easter Leah" and sentiment. If you notice I keep changing the background on this blog. LOL It is so much fun to see the blog dressed up in different clothes. Fab image i have used it aswell lol thanks for joining us at CRAFT. Cute card, i have also used this image on my GDT card, so thank you for joining us this week at C.R.A.F.T with your adorable card. Well you know I'd love it. So adorable! Isn't she adorable!!! Really cute card Dawn! Super cute. Happy Easter and thanks for joining us at ABC DT Challenge. Such a sweet Easter card. Thanks for playing the DTC this week. This is so feminine, Love the embossing folder. Thanks for sharing on the Belli challenge. What a darling card. Your image is perfect for the Easter challenge. Thanks for joining us at Delightful Challenges! A gorgeous Easter Card! Thanks for joining us at Creative Inspirations Wednesday's Challenge! Totally sweet - I love that Whimsie image! Oh this is so sweet!, the embossed background is the perfect accent for your adorable sweetie. Thank you for helping us celebrate our one year birthday at Aud Sentiments! This is absolutely delightful Dawn that image and the design are gorgeous, thank you for joining us at Aud sentiments.